Das neue TS-x77-System ist je nach konkreter Modellvariante mit bis zu zwölf Festplatten-Einschüben und einem Ryzen 5- oder Ryzen 7-Prozessor und bis zu 64 GByte RAM ausgestattet. In der TS-x77-Serie kommt entweder ein Ryzen 5 1400 mit vier Kernen, der Ryzen 5 1600 mit sechs Kernen oder der Ryzen R 7 1700 mit acht Kernen zum Einsatz. Gerade bei Visualisierungen dürften Nutzer auch vom Simultaneous Multithreading profitieren. Während grundsätzlich alle Modellreihen mit allen Ryzen-CPUs erhältlich sind, ist die maximale RAM-Bestückung bei den drei Reihen TS-677, TS-877 und TS-1277 unterschiedlich, selbiges gilt für die Anzahl der Festplatteneinschübe. So sind im TS-1277 bis zu 64 GByte DDR-RAM, vier 2,5-Zoll und 3,5-Zoll-Laufwerke möglich. Intern stehen zwei M.2-Slots bereit, in denen etwa SSDs untergebracht werden können. Die vier Gigabit-Ethernet-Ports können auf Wunsch mithilfe eines PCIe-Steckplatzes um eine 10-Gigabit-Verbindung ergänzt werden, zudem lässt sich auch eine Nvidia- oder AMD-Grafikkarte etwa zur beschleunigten Bildausgabe installieren. Die TS-x77-Reihe soll im dritten Quartal 2017 in den Handel kommen. Taipei, Taiwan, May 31, 2017 – Amidst the cutting-edge innovations in NAS, networking, and IoT presented by QNAP® Systems, Inc. at COMPUTEX 2017, the announcement of the world's first AMD Ryzen™-based NAS took center stage and underlined QNAP's commitment to push the boundaries of NAS performance and functionality. The new TS-x77 series leverages the incredible power of Ryzen, featuring processors with up to 8-cores/16-threads with Turbo Core up to 3.7 GHz to greatly boost virtualization performance. The TS-x77 is designed as a high-performance, highly-capable tiered storage geared for I/O intensive and virtualization applications, and also supports AMD Radeon™ and NVIDIA® graphics cards to satisfy resource-demanding video editing and playback. 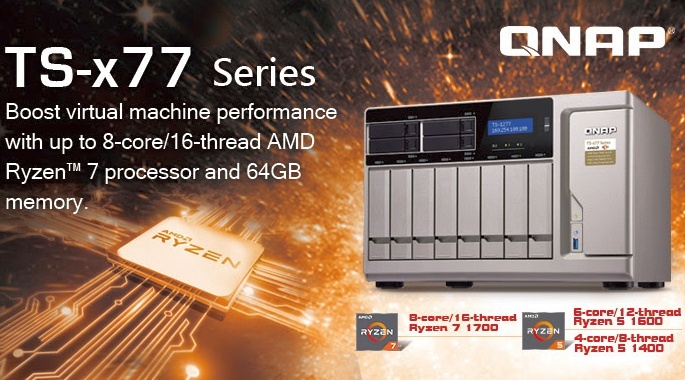 The TS-x77 series will be available in 6, 8, and 12-bay models with AMD Ryzen 7 (8-cores/16-threads) and AMD Ryzen 5 (6-cores/12-threads and 4-core/8-thread) processors that support AES-NI encryption acceleration and up to 64GB DDR4 RAM. Every model in the series provides three PCIe Gen.3 slots for incredible expansion potential for supporting 10GbE/40GbE NICs, PCIe NVMe SSD, graphics cards, and USB 3.1 expansion cards. Two M.2 SATA 6 GB/s SSD slots are provided for cache acceleration or high-performance storage pools. Incorporating incredible performance, scalability and reliability, the TS-x77 series provides an exceptional business-ready storage solution for running a wide range of business tasks (including cross-platform file sharing, backup, disaster recovery, and iSCSI & virtualization tasks) without breaking a sweat. The TS-x77 series features an excellent combination of hardware and software that delivers high expandability, high reliability, and all the tools necessary to satisfy IOPS-demanding workloads and multitasking. Download the TS-x77 datasheet for more information. The QNAP TS-x77 NAS will be available from Q3 2017. Check out the pre-release version of the TS-x77 series at QNAP stand J1217, COMPUTEX TAIPEI from May 30 to June 3, 2017. QNAP Systems, Inc., as its brand promise "Quality Network Appliance Provider", aims to deliver comprehensive offerings of cutting edge network attached storage (NAS) and network video recorder (NVR) solutions featured with ease-of-use, robust operation, large storage capacity, and trustworthy reliability. QNAP integrates technologies and designs to bring forth quality products that effectively improve business efficiency on file sharing, virtualization applications, storage management and surveillance in the business environments, as well as enrich entertainment life for home users with the offering of a fun multimedia center experience. Headquartered in Taipei, QNAP delivers its solutions to the global market with nonstop innovation. More information is at www.qnap.com.